Some of you write to me when you're looking for information. I love hearing from you and am happy to send a few links for reference reading. Today I want to introduce you to a resource onsite that can do almost as good a job as I can--sometimes better! This resource is called Lijit. It rhymes with 'widget'. Before we move on, let me assure you this search box won't give you any unpleasant surprises. It is designed specifically for searching MY site to help you locate articles of interest. Here's what you'll see. 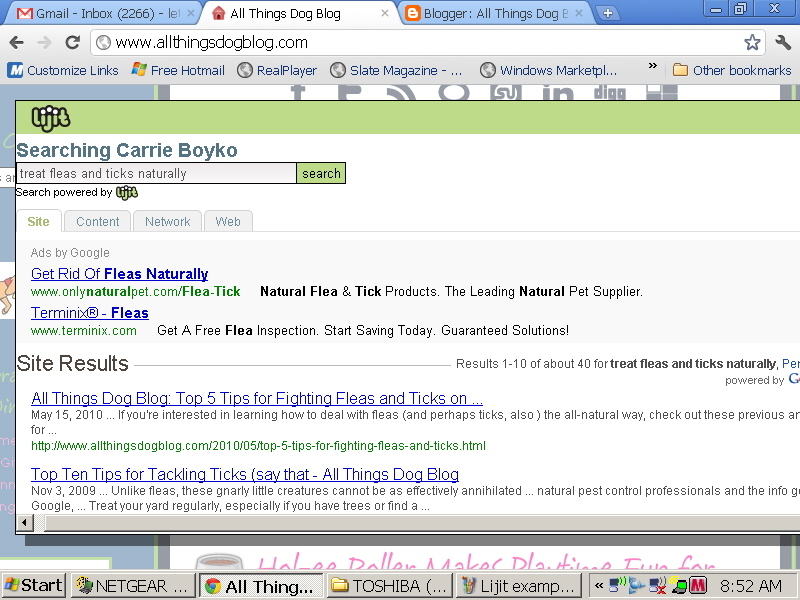 At the top of the screen there will be some Google ads, followed by "Site Results". This is what I have turned up on my site with the search terms I typed into the search box. The blue, underlined titles are links, so I can simply click to go to the article. It's that simple. If you try a different set of wording you'll find more results. There are many articles on natural pest relief for pets. My favorite is No More Ticks for Tanner, the story of our infestation after a camping trip and how we annihilated the critters with peppermint oil. No poisons, no toxins; just peppermint oil. Amazing! Now it's your turn. Take the Lijit search box in my sidebar for a test drive and see what you find. It's the closest thing to GPS that a blog can have. For more search help, visit the my other Wednesday post on using the Lijit search widget. Enjoy and happy travels. Dint know about the pepermint oil.. thats sucha simple solutions for them crazy ticks!.. Richa: It works great and smells wonderful. Hope all is well in your world. Give Chewie a hug from us. Love all the changes on your site. This one is awesome, will make finding all those articles I have read and want to re-read much easier.